We've now seen it several times on the path that goes around the neighborhood lake. My husband John has seen it, I've seen it at least twice. 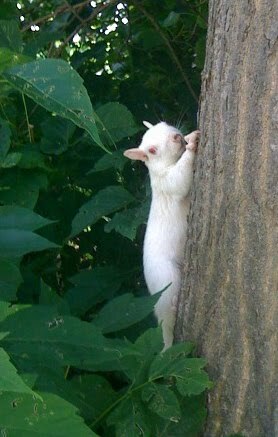 The albino squirrel. Actually, for all we know, it could be a whole family of squirrels, not just one, since it's been spotted on opposite sides of the lake. Or it could just be a squirrel that really gets around. It also seems a bit friendlier than your usual gray squirrel. When it saw me taking the photo, it paused for moment in its scramble up the tree and looked directly at the camera. Or that could be my imagination. I took the photo with my cell phone during the summer, so it's not the greatest (for one thing, you can't see the tail and the leaves are not green nowadays but orange-yellow-red.) Still, it seemed appropriate for Halloween for some reason -- there's something just a bit spooky about coming across a white-coated squirrel.